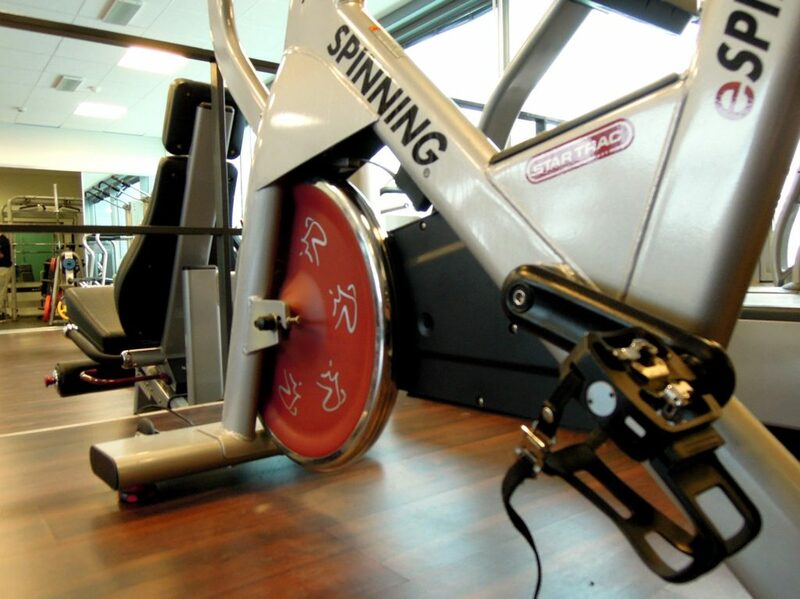 Stationary exercise bikes are one of the most common pieces of equipment found in gyms all around the world. And whilst they might not appear to be the most exciting piece of workout kit, there are certainly plenty of options for making your workouts on them interesting. A stationary bike is a worthy consideration to be included as part of your overall weight loss exercise program. Let’s take a look at the benefits of using a stationary bike, how to get started on one, and ways to get the best results for your weight loss and fitness improvement goals. Why use a stationary exercise bike as part of your fitness improvement and weight loss exercise program? If you’re investing in your own, you can choose one that specifically fits your needs and preferences. Do you just want the basics so you can sit and listen to your favorite podcast or music while you’re cycling? Or do you want a bike that you can hook up to your television so that you can go on a journey through a variety of simulated rides? The exciting thing is that there are plenty of choices so you can find one that’s right for you. It’s not exactly the same, but riding a stationary bike can help prepare you to take your riding outside later. The muscular endurance and cardio fitness you’ll develop from riding a stationary bike can transfer over to helping you out on outside rides later on. It’s generally a very safe equipment choice for your fitness and weight loss exercise program if it’s used properly. The low impact and non-weight bearing nature mean that it’s a good choice for most people who are recovering from injuries or need a controlled type of exercise that they can build up gradually. In saying that, if you do have injuries please check with a qualified personal trainer or physio before starting your exercise bike program, because every injury profile is different. There are three main types of stationary exercise bikes that you are likely to find in your local gym. Here are the basics on each, and when to choose each one. This is the one where you lean back slightly into a back rest. Your legs extend out in front of you more than up and down as they would with a traditional bike set up. The handles will probably be down by your sides, rather than in front of you. The recumbent bike is a great option for complete beginners or those with back issues. This is because it’s easier to maintain a safe, supported posture with the way the bike is designed. The back rest offers a little extra help. The seat will also be very wide for added comfort. You can use the recumbent bike while you are working on your back and core strength, with a view to moving towards a more traditional set up once you’re strong enough. This looks more like a traditional bike. The seat will likely be wider than an outdoor bike. Try this one as a progression from the recumbent bike once you know you can maintain a strong upright posture. This is a stationary bike with a weighted flywheel on the front. 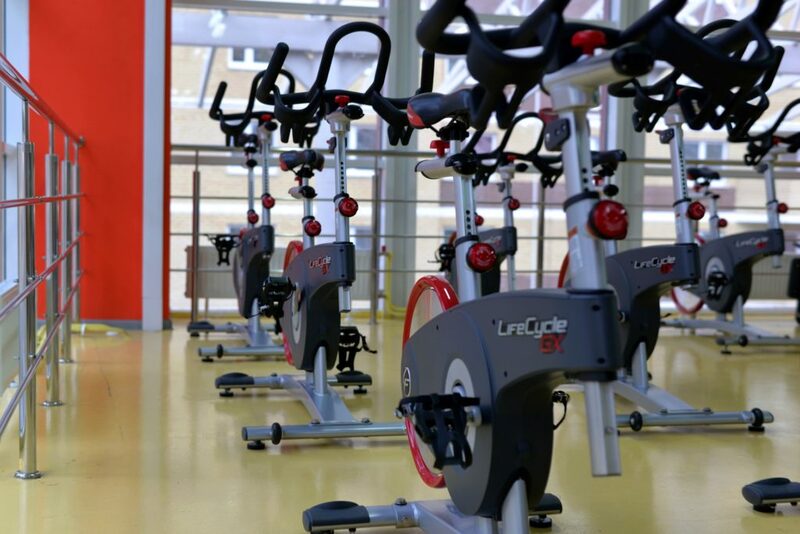 It’s the type of bike that’s usually used for exercise bike classes, and it replicates outdoor cycling more closely. It can be adjusted if desired so that you’re in more of a forward “racing” position. Use it once you’re really comfortable on the other two types of stationary bikes. Spinning® bikes have foot “cages” to strap your feet in, which go a step beyond the basic strap you’ll probably find on a recumbent or standard upright stationary bike. The seat…well you might find it takes a little bit of getting used to as its smaller and firmer than the ones on the other bikes. So your sit bones will probably feel it to begin with, but they will get used to it! Before you get started with your fitness and weight loss exercise program on the stationary bike, it’s important to understand how to set it up properly. Here are a few key points to consider when setting up your bike so you’re ready to ride! Stand beside the bike and adjust the seat to the height of your hip bone. This is a good starting point. Then get onto the bike and extend one leg down to the bottom of the pedaling motion. There should be a slight, comfortable bend in your knee. Having too much or too little flexion in your knee can lead to less efficient recruitment of muscles and will place extra strain on your muscles and joints. 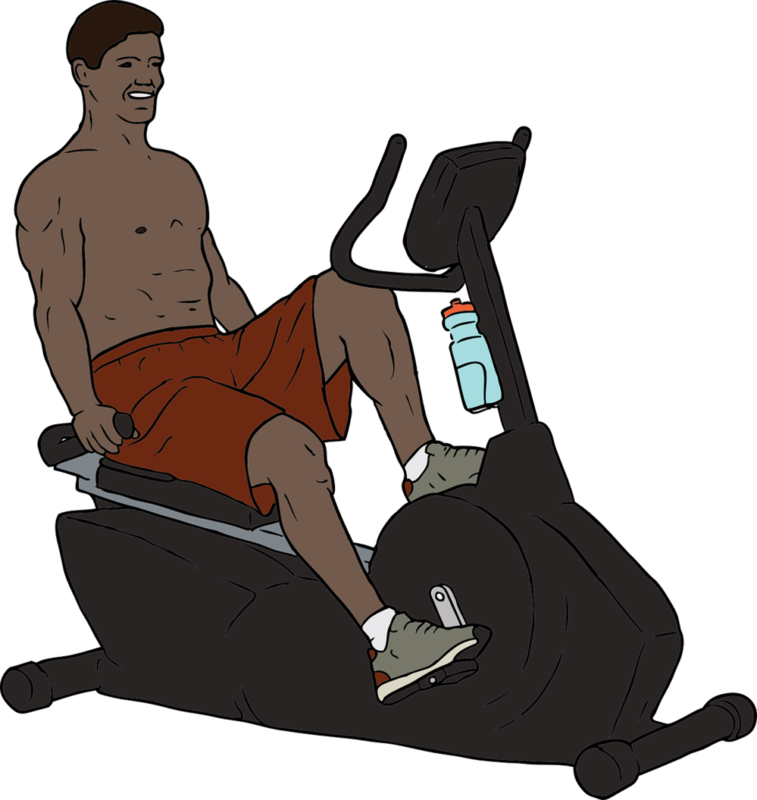 If you’re using a recumbent bike, the “hip height” part of this instruction is irrelevant but you’ll still adjust the seat so that you have a slight bend in the knee when one leg is extended out in front. If you’re using a spinning® style bike, the next step is to move the seat forward or backward to a good position for you. Sit on the bike and check that your knee is positioned just slightly forward from the middle of your foot. Having the seat too far forward or back will place unnecessary strain on your joints and decrease the efficiency of your ride. If you’re riding a recumbent bike, the handlebars will probably be fixed, down by your sides. For upright and spinning® style bikes, you’ll be able to adjust the handlebars up or down. Handlebar height will mostly be determined by the level of comfort desired and your riding style. If you’re a beginner, adjust the handlebars so that they are relatively high and help you to achieve a more upright position with a strong posture. As you become more advanced, and depending on whether you are working towards more of a “racing style”, you might choose to lower the handlebars. The position you choose should be relatively comfortable (once you get used to it!) without any undue strain on your neck and shoulders. You should be able to keep your elbows “soft” (slightly relaxed) without placing much weight through your arms. Finally, the balls of your feet should be over the middle of the pedals. This should help your feet to remain level without excessive weight through your toes. Again, this helps you avoid unnecessary strain on your joints and ensures you get the most out of your ride! Now that you’re set up and ready to get into your exercise bike fitness and weight loss program, let’s get started with a warm up! A warm up and cool down period should be used for any fitness or weight loss exercise program, and your exercise bike program is no exception. Warm ups are crucial to help get your blood flowing gradually, and to prepare the muscles, joints and nervous system for the workout ahead. Cool downs are often neglected in exercise routines but they are equally as important. They ensure your heart rate decreases gradually and they help avoid blood pooling and facilitate lactate removal in the muscles. There is a great little scale called “rating of perceived exertion” (RPE). It’s a subjective measure of how hard you are working. You can use it to help determine warm up and cool down intensities, as well as your intensity during the “work” phase of your session for any type of workout. The 1-10 scale[i] is probably the easiest to work with, whereby you determine how hard you are working by aligning your efforts with a number on the scale. Zero means you feel nothing at all, one is “very light”, three is “moderate”, five is “heavy”, right up to 10 which is “very very heavy” (i.e. your maximum). To make it easier to work with, just think of the number as a percentage – e.g. 3/10 = 30% of your maximum and 6/10 = 60% of your maximum. As a very general guideline, aim to warm up for five minutes at the beginning on your workout and cool down for five minutes at the end. Your warm up should slowly increase in intensity to prepare you for your workout and your cool down should gradually decrease in intensity in preparation for getting off the bike. For a warm up, start at RPE two and build up to RPE four so that you feel like you’re warm and your heart rate is up. For a cool down, start at RPE four and gradually make your way down to RPE two or one. Your fitness improvement and weight loss exercise program workout! Let’s look at some simple ways to get started with your fitness improvement and exercise weight loss program on a stationary bike. Basically, if you’re a beginner and you’re working on building your fitness up, start with a steady state program. More advanced riders can move onto interval programs including hills, sprints, or a combination of both. Steady state training will help you to build muscular endurance and cardiovascular fitness. It will also burn calories, thus helping you achieve your weight loss exercise program goals. Once you are advanced enough and can do so safely and effectively, a high intensity interval program on the stationary bike is likely to be most effective in helping you to burn fat and achieve your weight loss goals[ii]. For steady state training, first complete your warm up. Then simply choose a resistance level on the bike which has you sitting at around a 5-6 on the RPE scale. You should be able to maintain the intensity for the duration of the “work” phase. You should feel your muscles working well and your heart rate up. At this exertion level you should still be able to talk but you should feel like you’re working hard. Aim to maintain about 60-70 revolutions per minute (rpm) when riding a stationary exercise bike. Your resistance level will need to be adjusted to achieve this and to get you to the right place on the RPE scale. Start with a five minute “work” phase and build you duration up over time, depending on what your overall goals are and what else you’re doing in your program. 2 minutes pedaling fast. 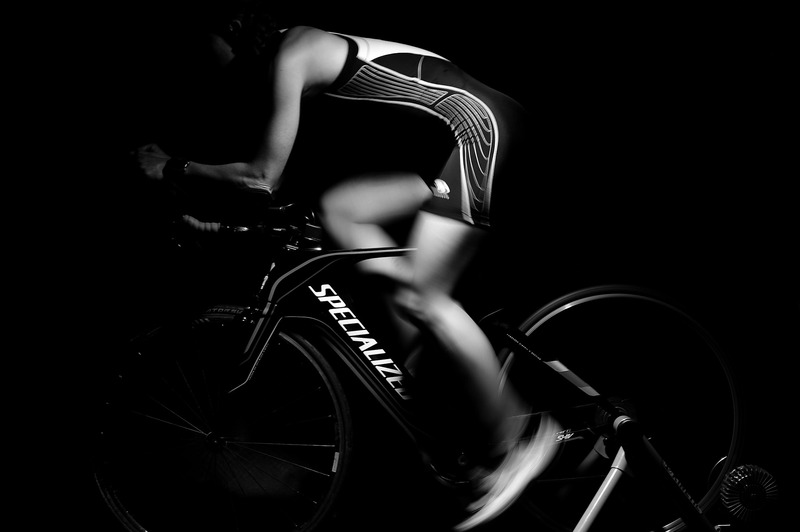 Try 100-110 rpm at the same resistance that you normally pedal for steady state to get you up to a 7-8 RPE. When you do sprints you need to ensure you’ve got sufficient resistance in order to maintain control. If you get this one right you may not need to adjust the resistance during this program. 1 minute normal pedaling speed. The frequency and duration of completing your stationary exercise bike program for optimal results will depend on your overall goals, experience and what else you are doing in your program. 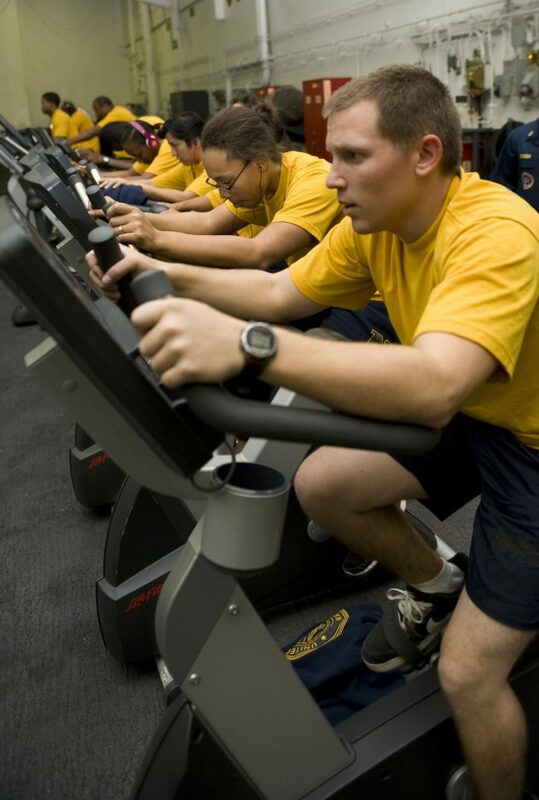 Your stationary bike program is a form of cardiovascular exercise. The American College of Sports Medicine (ASCM) recommends that most adults engage in moderate intensity cardio for at least 30 minutes per day on at least five days out of the week. They recommend vigorous intensity exercise for at least 20 minutes on at least three days per week[iii]. Note that moderate and intense cardio can be combined into one session.